RIP Tommy, I remember lying in bed at the old Preston Royal Infirmary, just after Christmas 1950, I'd been knocked down by a car going to Choir Practice and my mum and dad had let you know that I was very iill, they knew all of your family your sisters especially. You came to see me and being the man you was ended up going round every bed in the children's ward. I had the pleasure of spending an hour and a half with Sir Tom driving to a Fairtrade event where he was guest of honour. Here was a legend sitting next to me in my car but he just wanted to know about me and what I did for a living. That is the humility of the man. A world famous legend and he wanted to know about me! It is with great sadness to hear of the demise of Sir Tom. One of my proud moments in life was meeting you at one of the Preston North End games. I was then the President of The Hamilton & District Soccer Association in Hamilton, Ontario, Canada. You were a great asset to Football. and my son and his wife. I had the pleasure to meet your son Brian the day after your funeral. Rest in peace Sir Tom I will never forget you. As a schoolboy Tom Finney was my hero and the player I always pretended to be when I played on the wing. I only had the pleasure of seeing him play twice (against Bristol Rovers in the FA Cup when we drew the first leg in Bristol and then I travelled to Preston to watch the great man totally demoralise us in the replay. What a player and what a gentleman. If only present day players could play with his skill and fair play! RIP Sir Tom. My dad took me on PNE to see the the legend that was Tom Finney, unfortunately it was the game against Chelsea when we were beaten 5-4 and a certain Jimmy Greaves scored all 5 goals for Chelsea. Being a boy of around 6 years old and not having an allegiance to any football club all I talked about on our way home was Mr Greaves. 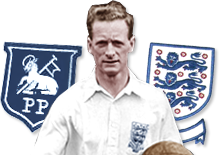 I was too young to appreciate the Jewel that was Sir Tom but......I can always say, and say with pride, I saw Tom Finney play! You were a wonderful role model, who used your special talent as a footballer to your best ability, and you always seemed to make people that you met feel special. Well deserved too. What a man, in every sense. You were just "always there", a beacon of pride, throughout my life. With thanks to Ian Rigby, Brian Ellis, Alex Black, James Black, Theo Squires and Hannah Tipler.